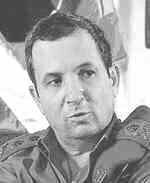 Ehud Barak (Brug) was born at Kibbutz Mishmar Hasharon on February 12, 1942.He enlisted in the Israeli Army at age 17, became a career army officer, and helped to found and lead the elite Sayeret Matkal covert operations commando unit. He saw significant action t in the 1967 Six-Day War. He came to the attention of his superiors because of his ingenuity, exceptional bravery and coolness under fire. In the Yom Kippur War of 1973, Barak commanded a tank battalion on the Sinai front. As commander of the Sayeret Matkal, Barak led his men in storming a hijacked Sabena airliner in Tel Aviv. On another occasion, disguised as a woman, he led a raid in Beirut to kill terrorists who had murdered Israeli athletes at the 1972 Munich Olympics. Barak played a key role in planning the famous Entebbe raid in Uganda, rescuing passengers of a hijacked airliner held hostage in the airport. After serving as head of Israeli Intelligence and Central Command during the 1980s, Barak was appointed IDF Chief of Staff, in 1991. Though his academic education was repeatedly interrupted by calls to active duty, Barak earned an undergraduate degree in Physics and Mathematics from the Hebrew University of Jerusalem and a Masters in Economic Engineering Systems from Stanford University. He is also a gifted pianist and linguist and likes to take apart watches and other machines. After serving as Chief of Staff, Barak became Interior Minister in the government headed by Yitzhak Rabin. In 1995, when Rabin was assassinated by Yigal Amir, Shimon Peres became Prime Minister, and Barak replaced Peres as Foreign Minister. Barak's campaign advice was ignored by Peres's reelection staff, and Peres lost the election narrowly to Benjamin Nethanyahu. Barak then took over leadership of the Labor Party. Barak became Prime Minister, leading the Labor Party to a landslide victory over Benjamin Netanyahu in 1999. He declared that his goals were to continue the unfinished work of his mentor, Yitzhak Rabin: to make peace with the Palestinians and Syrians. Barak believed that the Palestinians would be more flexible if Syria was not opposed to the peace process. Accordingly, he first tried to make peace with the Syrians, but Hafez Assad, President of Syria, eventually refused the offer presented by Barak through US President Clinton. To prevent the Syrians from pressuring Israel by inspiring guerilla actions in Lebanon, Barak ended Israel's 17-year occupation of southern Lebanon. He tried unsuccessfully to revive the Oslo peace process that had been delayed and neglected during the time of Benjamin Netanyahu. Negotiations at Camp David broke down however, and Palestinians initiated violence against Israel in September, 2000. Nonetheless, Barak continued negotiations at Bollings Air Force Base and later at Taba, offering unprecedented concessions. The Palestinians refused Barak's offers and President Clinton's bridging proposals. Against the background of Palestinian violence and failed peace negotiations, Barak was roundly defeated in the next election by Ariel Sharon. After a long absence from politics, he returned in 2005, but failed in a bid to lead the Labor Party. In 2007, Ehud Barak returned to Israeli politics again, running in Labor party primaries for the role of Chairman against incumbent Amir Peretz, Ami Ayalon Ofir Pines and others. Beginning from fourth place in the polls, Barak beat all other candidates in the first round, and then narrowly beat Ami Ayalon in the second round, despite a big lead for Ayalon in the polls, becoming chairman of the Labor party on June 12. Ayalon was hurt by his alliance with discredited defense minister Amir Peretz . Subsequently, Barak became Minister of Defense in the Olmert government. Everyone agrees that he has set about rebuilding the IDF in a professional and competent manner, following the less than satisfactory performance in the 2006 Lebanon war.